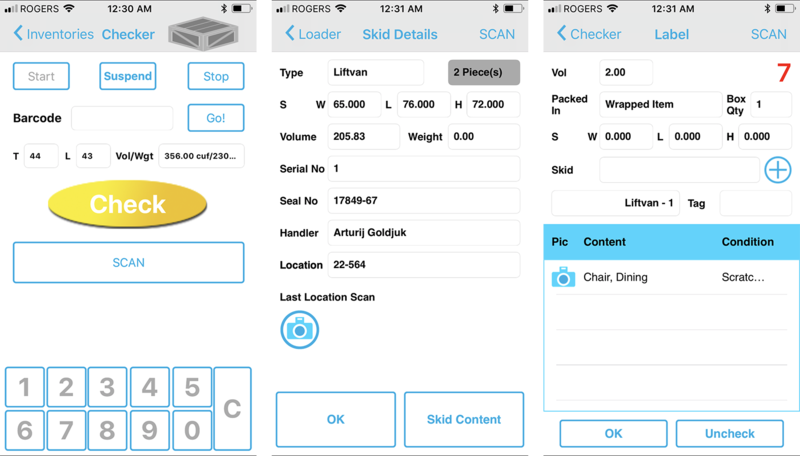 Checker is a mobile application that allows to create bingo sheets, loading sheets, capture condition notes, handle package transfers and inventory check-off. Checker uses Voxme inventory file recorded via Voxme Inventory or Voxme MF. This file can be easily shared between offices and agents. Inventory files can be loaded on a Checker unit via Voxme MF, Internet connection, by email or directly from any desktop computer via USB. Checker uses label's barcode to identify a corresponding shipment's piece. It can display the content of that piece, mark its location (if the shipment is being loaded into multiple lfitvans or containers or flag it 'Unloaded') and help the crew record exceptions for each article). Origin agents use Checker to control loading of consolidated containers. Destination agents use Checker to sort consolidated containers. Delivery crews benefit from Checker's ability to answer the typical customer questions like "What's in this box?" or "What room did it come from" and, of course, "Was this scratch here before?" Ability to generate a bingo sheet directly from Checker or via Voxme MF.